The Dalai Lama has launched a mobile app for followers to stay up to date with his travels and teachings. The exiled Tibetan spiritual leader, 82, already has a Twitter account with more than 16 million followers. His free app, currently only available on iPhone, will hold news, videos, photos and information. In 2013 the Roman Catholic Church launched the Pope App, which followed the Confession app where users could keep track of their sins. And other religious apps have sprung up, allowing leaders to keep in touch with congregations and helping people find food that conforms to their religious requirements while travelling. The Dalai Lama's app, simply titled Dalai Lama, does not have enough ratings yet for a points scoring on the app store. 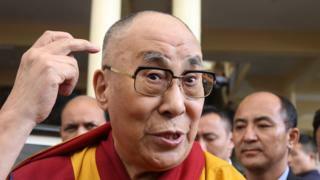 Media captionDalai Lama: "Make closer contact with people from different faiths"
He advocates self-rule for Tibet within China but is regarded by Chinese authorities as a "splittist"